Today is an exciting day at Daydreams of Quilts. We have a gorgeous giveaway of seven fat quarters sponsored by Country Clothesline. Sylvia, of Country Clothesline, was so kind to send me a bundle of these too so that I could create a tutorial for all of you readers of my blog to give you an idea of what you could make with these fabrics. Thank you so much Sylvia! This bundle is available for sale in the pre-cuts section of Country Clothesline and is called the China White bundle. Okay let's get to it! The Rafflecopter for the giveaway will be at the bottom of this post. This is what we will be making with this tutorial. Take your seven fat quarters and press them. Select one fat quarter for the binding and two for the backing. The backing of the pillow will have a main fabric and an accent fabric. Cut five 2 1/2 inch strips from your binding fabric and set aside. Cut 5 two and a half inch strips for binding. If you have a hexagon template from a Moda Honeycomb it will make this very easy. If not, you can make a hexagon with template plastic. Each side is 3 inches. Trace around your hexagon template with a Frixion pen or a water soluble fabric pen. Make sure to get the little dots in each corner a quarter inch from the traced lines. Continue tracing all the way up the leftover piece of binding fabric butting up the hexagons to each other to reduce waste and also speed up cutting just a little bit. When you can't trace anymore hexagons stop and set aside for now. Take your main pillow backing fabric fat quarter and cut it in half to make two fat eighths 9 x 20 inches. Set aside. Take your accent pillow backing fabric and cut in half. Set one half aside and cut the other half in half again so you have two pieces 4.5" x 22" and a fat eighth. Set aside the two narrower strips for now with the binding and main backing fabric. We don't need them until the end. Pieces cut from backing accent fabric. Continue tracing hexagons onto all your fat quarters and the remaining fat eighth from the backing accent fabric. The only fabric that won't be on the front of the pillow is the backing main fabric. You need 22 hexagons. Start sewing the sides of the hexagons together in rows. Put your needle in on the dot at the top of the seam and take it out on the dot at the bottom of the seam. Do not sew past the dots into the seam allowance. Your seam should look like this. If you want to take a little back stitch at the start and end it couldn't hurt. I always forget to do that. When you have all your hexagons sewn into rows it will look like this. Now you can begin sewing the rows together. Note, we do not press yet. We need the fabric flexible so we can manipulate it for our Y seams and pressing it will erase our little dots that show us where to start and stop our seams. Place the last hexagon on your second row over the last hexagon on your first row. Your second row will slant down on the right of the first row. Sew from dot to dot on your first seam. Here I am showing you the hexagon from the first row underneath. For your second seam on the first hexagon that you are sewing your second row will slant upwards to the left of your first row. Again sew from dot to dot. When sewing these "Y" seams it is necessary to manipulate the fabrics so they are not in your way and you can get your two pieces that you are working on lying flat. Here I have pinched the white floral fabric and folded it in half to get my seam on my pink polka dot fabric to lie flat for stitching. Here's a look at the white floral fabric from another angle so you can see how I have pinched it with my fingers by the seam allowance and folded it so the pink polka dot fabric is lying flat. Here is the pink polka dot fabric tucked in (on the left) so I can get my seam line that I want to sew (on the right) to lie flat. Continue sewing all your rows together and then press them at the end. Normally we press our rows before we sew them together when quilting but that will not work for us here with the need to manipulate our fabric to make the Y seams. When you are pressing everything at the end just let the seams fall how they naturally want to fall. Then trim up the sides of your pillow top so they are even. Your pillow top will measure about 19 inches square at this point. Layer it with batting and an inexpensive lining fabric (such as muslin) and quilt it to your liking. You don't have to have the lining but I think it's nice and it will probably wash up better if you have a lining on the back of your batting. Then create your pillow back by sewing your two accent strips into your main fabrics with a quarter inch seam. Fold down the raw edges a quarter inch and press. Then another quarter inch and press again to create a hem. Then stitch. Lay your backing pieces wrong side up and overlap them by a couple of inches (or more if you can/want). This creates an envelope back. Lay your quilted and trimmed pillow top face up and pin all the way around. Here is the back of the project after pinning all the way around. Working from the front sew all the way around your project twice with a 1/8 to a scant 1/4 inch seam (you will want this seam to end up inside the seam allowance of your binding so it doesn't show). Trim away excess backing fabric with your rotary cutter. Then make your binding with your five strips that you cut at the beginning. Fold in half wrong sides together and press. Attach your binding to the front as you would with a quilt and then fold around to the back and hand stitch down to the back of your project (just as with a quilt). And you're done! Put in an 18" pillow form and enjoy your beautiful new hexagon pillow. Here it is in a Poang chair from IKEA to give you an idea of size. I have this as a decorative pillow on my bed now. I hope you will have a chance to sew up a pillow cover of your own. 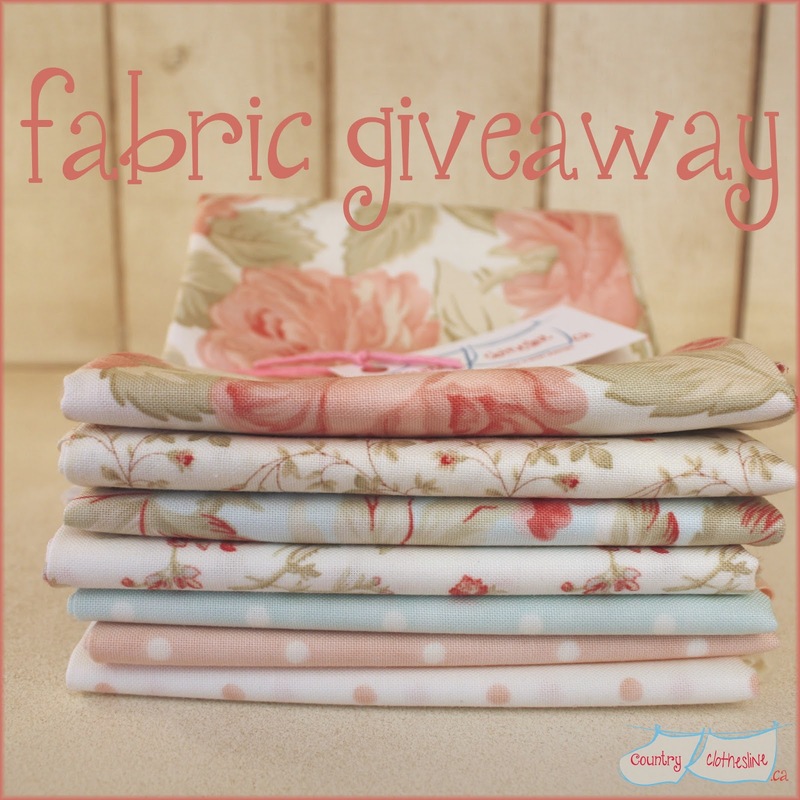 Please enter to win these lovely fabrics designed by 3 Sisters for Moda. If you cannot wait to get started you can order all seven of these fabrics from Country Clothesline. This giveaway is open to everyone including our international friends and will close in a week. The winner will be contacted by email. Best of luck to you and thank you for visiting us in our various online places. If you do not have Facebook you can sign in with your name and email on the Rafflecopter.